The introduction and promotion of productivity-enhancing food crop technologies has been the heart of the SAA agricultural program since its inception in 1986. 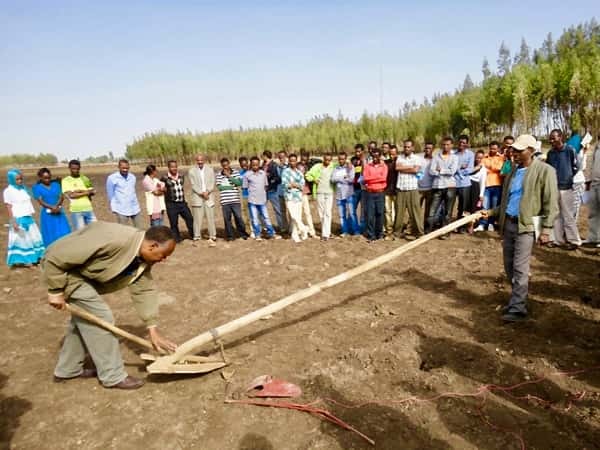 Packages of improved technologies (comprising mainly fertilizer and improved varieties, climate smart production technologies and good agricultural practices) have been introduced to more than 3 million farmers through extension demonstration plots. The key priority crops are annuals and include among others cereals such as maize, sorghum, millet, rice; oil seed crops such as soya beans, sesame, ground nuts, sunflower, groundnut; legumes (cowpea and various beans) and tuber/root crops such as cassava or sweet potatoes. The main production technologies being disseminated within the Farmer Learning Platforms (FLPs) are need-based and include (but not limited to) use of high yielding, drought tolerant or nutritious crop varieties, in combination with recommended and/or site-specific soil organic amendments, fertilizer rates and other good agricultural practices (GAPs) such as proper site selection, land preparation, planting, timely weeding and pest & disease control, soil and water conservation measures etc.). Crop yields in these plots have been typically 2–3 times greater than those obtained by farmers. Despite this potential, it is unlikely that more than 20–25% of farmers adopted the recommended packages, especially the fertilizer recommendations. The packages were just too expensive for most smallholder farmers and access to the inputs was often a serious stumbling block. 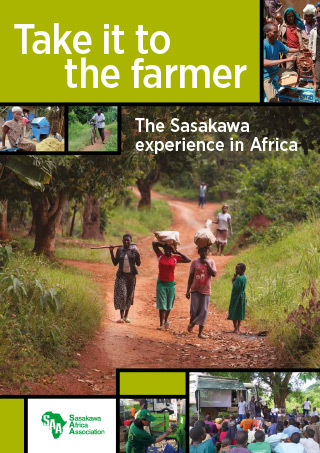 In 2009, SAA began a new effort to introduce a more participatory approach using community consultation in which farmers work with extension staff to identify their genuine needs and select from a menu of options the kinds of technologies they feel may be most appropriate to their circumstances. For example, we are offering two to three options for soil fertility management, some with lower doses of chemical fertilizer combined with greater use of organic sources. Technology promotion is now conditioned by a more explicit objective to increase farmer incomes (not just yields and total production). Thus, cost and risk considerations weigh more heavily in deciding which technologies to demonstrate. 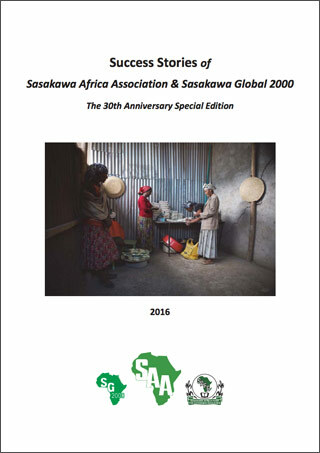 SAA is seeking to allocate 70% of our Theme 1 resources to reaching farmers previously not served by extension advisory services, especially women farmers but also resource-poor farmers and those in more remote locations. The remaining 30% of Theme 1 resources is directed at the relatively better-off smallholder farmers, who traditionally are ‘net food sellers’ or have the potential to become so. Here, the priority is high yield potential and grain quality, with an eye on maximizing value addition and income. This work is channeled through farmers’ associations, which are needed for smallholder farmers to engage successfully in commercial markets. This field-centered training is offered to extension subject matter specialists (SMSs), frontline extension officers (EAs), community-based facilitators (CBFs), smallholder farmers and other stakeholders, such as input dealers and seed producers. 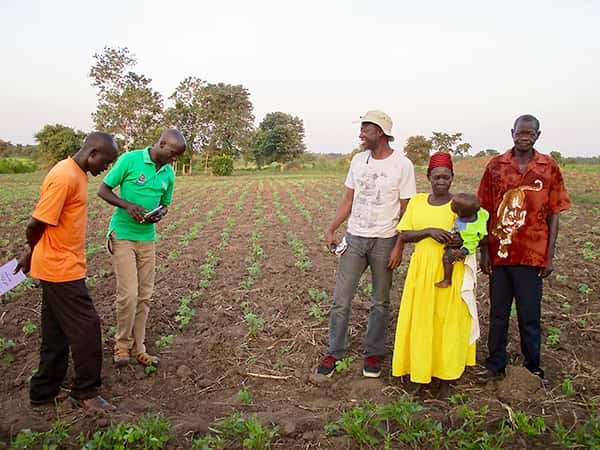 For farmers, extension officers and community-based facilitators, training is provided at the beginning, in the middle, and at the end of the cropping season. Training is also provided to members of farmers’ organizations (led by Theme 3, but with Theme 1 involvement). Sessions revolve around farming as a commercial enterprise and include planning and priority setting, the selection of technologies, budgeting, and cost/benefit comparisons. The SAA country programs began implementing Farmer Learning Platforms (FLPs) in 2009 as the main training and extension methodology. 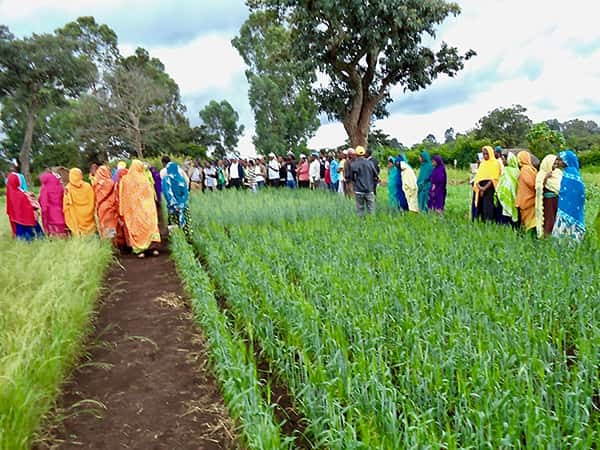 FLPs consist of three types of demonstration plots: Community Demonstration Plots (CDPs) which are composed of Women Assisted Demonstrations (WADs) and Men Assisted Demonstrations (MADs), Technology Adoption Plots (TAPs) and Model Adoption Plots (MAPs). One CDP is normally 1000 m2 in size and is surrounded by various community practices to illustrate the superiority of improved SAA’s technological packages over the traditional community practices. 4 CDPs are set up in each community to address key production constraining factors identified as a result of community consultation. The 4 CDPs are gender-balanced, 2 are led by women (Women Assisted Demos - WADs), and 2 others by men (Men Assisted Demos - MADs) as to address gender-specific problems/needs while achieving both food security and income generation through crop diversification. WADs are intended specifically for resource-poor women farmers who have been excluded in the past from direct involvement in crop demonstration. Furthermore, youth and people with special needs are streamlined across both WADs and MADs. About 15-20 farmers organized into a farming group are assigned a CDP. 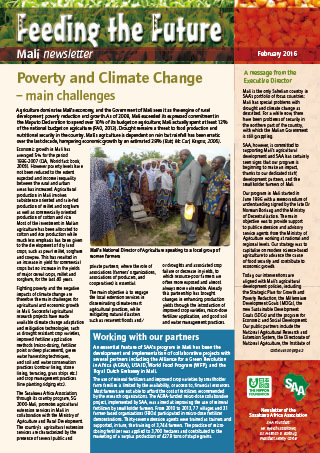 CDP serves as the primary focal point for (i) community- and group-based agronomic training and technology evaluation, (ii) organizing community-based field visits for information and knowledge sharing among the hosting farming communities, (iii) and as a tool for introducing and disseminating technological innovations. Many farmers who participate in the FLP training and field days will then experiment with the demonstrated new technology options on their own land and at their own expense before making a final decision to adopt and scale up production. We call these plots Technology Adoption Plots (TAPs). TAP farmers purchase the inputs, use whatever plot size they wish, and are free to select one of the several options that were demonstrated. Technical advice is provided as needed, and adoption process is closely monitored by SAA program staff in close collaboration with national partner extension service providers. Current speed and intensity of climate change and associated crop failures are undermining food security with ever-greater frequency, especially in parts of sub-Saharan Africa. Currently, SAA program is therefore streamlining climate change and related knowledge generation in its Farmer Learning Platforms through need-based demonstration of climate-smart technologies with primary focus on drought prone or affected areas. The climate smart technologies being demonstrated include among others seed priming, use of drought tolerant/early maturing varieties, soil and water conservation techniques, small-scale irrigation techniques (manual and small engine water lifting devices), and less carbon and nitrogen emitting technologies such as micro dosing (millet) and fertilizer deep placement (irrigated rice).